Sandy has been playing for contra dances for nearly 50 years. In the 1970’s, he was a founding member of the Roaring Jelly dance band (which is still going strong) and the Common Ground quintet. Back then, he also played occasionally with Dudley Laufman and the Canterbury Country Dance Orchestra. He subsequently spent over 20 years as the founder and director of two long-standing community contra dance bands, both of which are also still playing for monthly dances: the Berlin Country Dance Orchestra (Berlin, MA), and Oh, CONTRAire! (Westford, MA). He has recorded with a number of traditional musicians, including Tony Saletan, Jay Unger, Jerry Robichaud, and Trapezoid. He has also played for many well-know dance callers, including Dudley Laufman, Ted Sanella, Larry Jenkins, Tony Parkes, Lisa Greenleaf, and Sue Rosen. For the past 20 years, Sandy has enjoyed bringing horns back into the instrumental mix of contra dance bands. (In the 1940’s and 50s, New England contra dance bands commonly incorporated horns as lead melody instruments.) He delights in playing traditional dance melodies note-for-note on his saxophone. 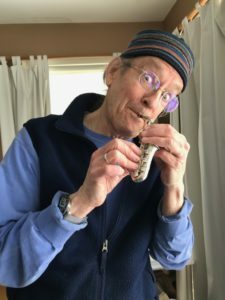 Sandy currently plays wooden flute, penny whistle, and saxophone in Flowing Tide, a Mid-Coast-based contra dance quintet. He also plays regularly with the Oyster Creek Fiddlers at their monthly family dances in Damariscotta. He can be reached at 17 Juniper Lane, Bristol, ME 04539-3006 | (207) 563-7263.